Jerusalem 2050 competition(2007): During my bachelor studies, I participated in ‘Jerusalem 2050’, a competition organized by School of Planning & Architecture, MIT. For this competition we had to given solutions of the problems, city of Jerusalem 2050 might face in the year 2050. This was my first time in directly addressing international conflicts and importance of UN in these situations. We have suggested 9 point strategic solution with prominent involvement of UN. We have touched upon issues like security, infrastructure, education as well as given suggestions to resolve ongoing conflicts. Online volunteer, UNDP(2008): A short project, ‘Poverty Reduction Center in South Africa’ brought me closer to understand role of international organizations in addressing some of the complex issues of today and upcoming challenges of tomorrow. COP 15 climate summit, Copenhagen(2009): With a student observer, I understood complex decision making involve and why UN is important in acting as a good platform for talking to other people and bringing many of the actors together in doing lot of stuff.. blah blah… It was fascinating to study being a chemical engineer, all these things..
9th European Commission Open Days & Young Environmentalist camp, Azerbaijan(2011): Participating in these events gave me exposure towards difficulties in higher level decision making. I have personally experienced difficulties in arriving at common conclusions in making critical decision when it involves participants from many countries. Definitely, it is not just governments, business corporations too must be facing difficulties in negotiating when so many stakes are involved. This partially explained the reasons for some delay in decision making by the governments. How I came to this course? Last year, I was studying a lot about international affairs as part of my ‘Zero Cost MBA(Global Manager for 21st Century’ project. Not just international affairs, I also wanted to know functioning of UN(or bigger organizations) in slightly structured manner. Knowing UN could also be helpful in understanding complexities involved in the big organizations spanning across different countries. 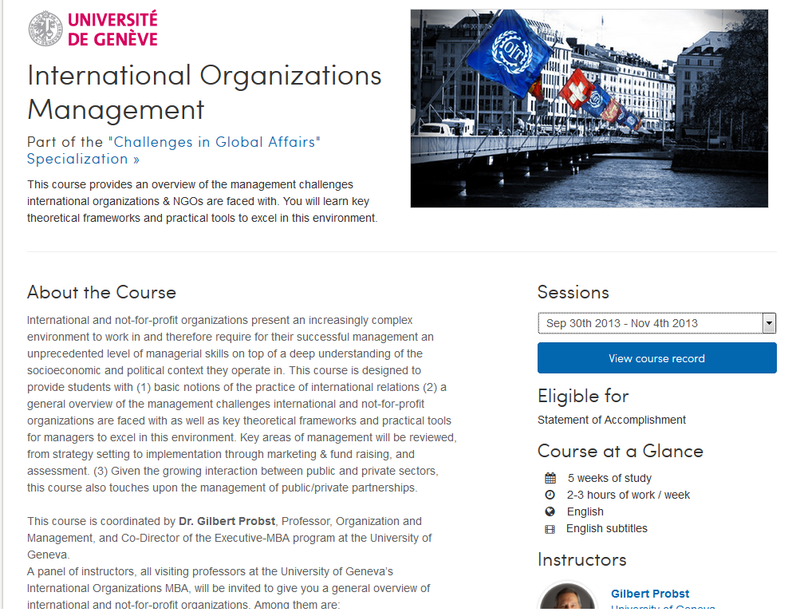 Through one of the LinkedIn group, I heard about the course, ‘International Organizations Management’ and immediately enrolled into it. My objective was to go deeper in understanding the complex decision making of international organizations and utilize this in my ‘Envisioning 21st century global manager’ project. Video lectures: Lectures were informative and provided good overview in functioning of UN, structural divisions, mandate among different agencies and how entire UN is funded. Very interestingly they highlighted associated problem in the expansion of security council and rising influence of BRICKS in global power regime. It pointed towards the declining dominance of IMF, world bank in the upcoming years. Existing drawback of UN system and need for collaboration for utilizing joint resources were the need of time. Equally important was knowing the perception behind PPP(Public Private Partnerships) and their roles. Lectures ignited our own curiosity by asking serious questions and ponder on them at discussion forums. Although UN looks very big and fascinating organization, still it serves merely a platform for discussion which may not be the working department. But still it got good appeal, evident from the lectures on marketing and fund raising in the last week. Successful example was HIV free AIDS campaign all around the globe. Emphasizing on managing brand, effectively using both traditional and social media was on the card. Given value to people is key in conveying the message to everyone and this is how it works. Discussion forums: Discussion forums had a very diverse range of people from all backgrounds, age groups and different nationalities. There has been considerable interest among us to know how is the global context shifting with the rise of emerging economies? What does it mean for global cooperation when state many not be the only important actor? Why should international organizations care when they are just merely a platform for discussion but not a real decision makers? We all were taking parts in the decision making process through discussions, clarifying our misconceptions and giving our inputs. Questions like power imbalance, restructuring of UN and procedures to follow Public power partnerships were given so much attention. Upcoming challenges in front of us and importance of UN as a platform for solving these challenges was favored by majority of the participants. I could see the sense of globalize formal atmosphere and deep division on our own belief, explaining why it is so difficult to arrive on conclusion on many issues. Public Private Partnership Analysis & Quizzes: Quizzes were not that difficult after going through the lectures. The Public Private Partnership assignment was very short but still enjoyable in finding the possible reasons for such partnerships. This course gave me a good overview of what can be the challenges for any international organizations, whether it is non-profit, humanitarian or just a business ones. Understanding how to handle multiple issues was very important as part of my ‘Zero Cost MBA(Global Manager for 21st Century)’ program and this course fulfilled all my objectives. Thank you University of Geneva and entire faculty team for this wonderful course. It certainly enriched my knowledge and I hope to use it in proper ways in future.